Every month we speak to women entrepreneurs who have just launched into the business world. In the hot seat for January’s Women Who Launch is Maria Betts of Maria Lucia Bakes. Maria Lucia Bakes produce a range of healthy tasty gluten wheat and dairy free granola and toasted muesli cereals. The business in based in Rathfarnham, Dublin and currently employs two. Product is outsourced to a dedicated gluten free bakery which allows Maria to focus on NPD, marketing and the other activities. Her objective is to grow a strong gluten free brand in Ireland with sights clearly set on extending her reach abroad. We have invested our own money to date, with an overdraft from AIB, which is sufficient for where the business is at present. When we started the business we thought our customers would be people with coeliac disease or a gluten intolerance and they certainly make up a big percentage of our customers. What we didn’t expect was to have an even bigger market in health conscious people who are looking for a healthy, low sugar, breakfast cereal that happens to be gluten free. Eating breakfast outside of the home is a growing trend with many people taking food to the office or eating in the car, so we responded by bringing out a range of ‘On the Go’ single portion pots of granola and porridge earlier in the year. There are so many wonderful companies out there, way too many to mention here. In 2014 we took part in the Food Academy programme which is an initiative between Bord Bia, Musgraves and the LEO’s that was set up to nurture startup food companies. On this course we met lots of amazing companies, like Cool Beans, Boutique Bake and Improper Butter, to name just a few. Each of these companies have gone from strength to strength and it’s fascinating to watch their progress as they grow and overcome the inevitable challenges associated with young companies. 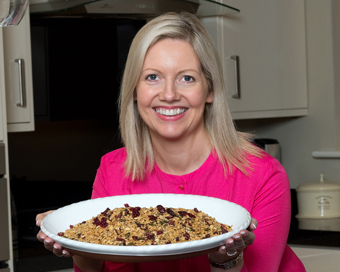 We were delighted when our Cranberry Coconut and Chia Seed Granola won the overall Cereal category in the Irish Quality Food Awards in 2015 as it was up against stiff competition from a lot of well known cereal brands. It proved that gluten free food can be as good if not better than regular food. It is hard to pinpoint a major event or slap in the face, however all along the way we have faced challenges. Entering the food business with no prior experience has meant we have had to learn as we go along. It is likely we will continue to face challenges now that we have started exporting to different parts of the world where there are so many differences in tariffs, duties, taxes, labeling requirements, language barriers and exchange rate fluctuations. Are You Social When It Comes To Media? We have been quite active on social media since day one. We use Facebook and Twitter to keep in touch with our customers and find it very effective for getting feedback on our products. It is a good way to build brand awareness when you have a limited budget. We have recently started using Instagram. We were delighted to win a merit award for innovation for our new ‘On the Go’ pots at the recent Irish FreeFrom Food Awards. When we researched the market we found there were lots of porridge, cornflakes, and rice crispie pots but no granola pots. We created a pot with a spoon inside and room to add yogurt and fruit. Very handy for busy people on the move. We also brought out a gluten wheat and dairy free porridge pot, lightly sweetened with coconut sugar, in response to customer requests for a dairy free porridge pot as most on the market contain milk powder. We were proud to receive an award for this pot also at the Irish Freefrom Food Awards. It was always our intention to follow an outsource manufacturing model which would allow us to expand our business with less risk. We are currently growing our business outside Ireland with a new supermarket listing in Norway and we have customers in the UK and Hungary. Our manufacturer has plenty of capacity and we can concentrate on building the brand and identifying opportunities. Worst – Overly focused at times to the exclusion of everything else! Disorganised with paperwork, insomniac. Richard Branson – I admire him for his tremendous success in building diverse businesses and for his positive outlook on life. I’d rather paddle my own canoe, make all the decisions and not have to consult anyone! Talk to as many people as you can in business before you invest too much time or money. If you can talk to people in similar businesses then all the better. This is bound to save you lots of time and heartache. Also, hire a really good mentor, someone who has run a business in the past and knows the ins and outs of business in the real world. Having the inside track can save you a lot of money and stress.